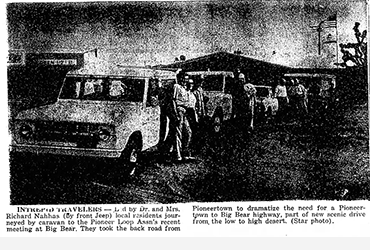 PIONEERTOWN – A photographic expedition up historic Pioneer Pass is scheduled for Sunday. The Pioneer Pass Pushers are sponsoring the trip which will begin, for those from the Morongo Basin area, at the red dog in Pioneertown. Meeting time is promptly at 9 a.m. Inspector candles down Kendall Stone, who is starting from the Big Bear end of the road, we’ll join the party at Arrastre Creek. He will guide the photographers to such interesting places as the Devil’s Stool, the Needles Eye, The Pipes, Old Spanish Smelter, Indian grave and Golden Stairs. 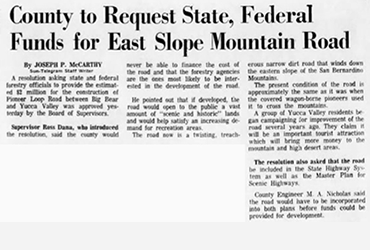 A great deal of interest is being shown in the project to make the Pioneertown to Big Bear road, now known as Pioneer Pass, negotiable by ordinary car as soon as next summer. The former cattle trail will again know the pounding of cattle on Pioneer Pass weekend April 18 and 19 when a full-scale cattle drive from Pioneertown to Big Bear is planned. 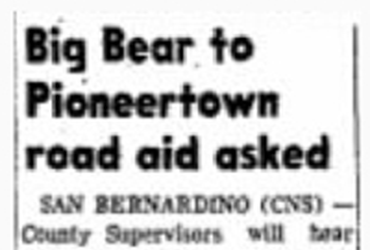 Many Big Bear residents haven’t entered enthusiastically in the pioneer pass push I will join in the photographic expedition Sunday. One word of warning was issued by Stone–the trail is steep and full of ruts in several places, four-wheels drives or pick up trucks are preferable for making the journey.